It’s not always easy to find a postcard. Especially in the middle of nowhere, but sometimes even in the middle of somewhere! Sebastian made this postcard using My Postcard, and there are plenty of other postcard making sites if you also want to send a card but can’t find one. Sebastian and The Coddiwomples embarked on an epic journey which you can read about here. Team mates Sebastian and Hugo are prior students of Geography Cat’s human assistant and she is terrifically proud of them. Latitude and longitude lines create a grid which we can use to pin point any location on the surface of the globe. Latitude shows how far north or south of the Equator the location lies, while longitude shows how far east or west from the Greenwich Meridian. 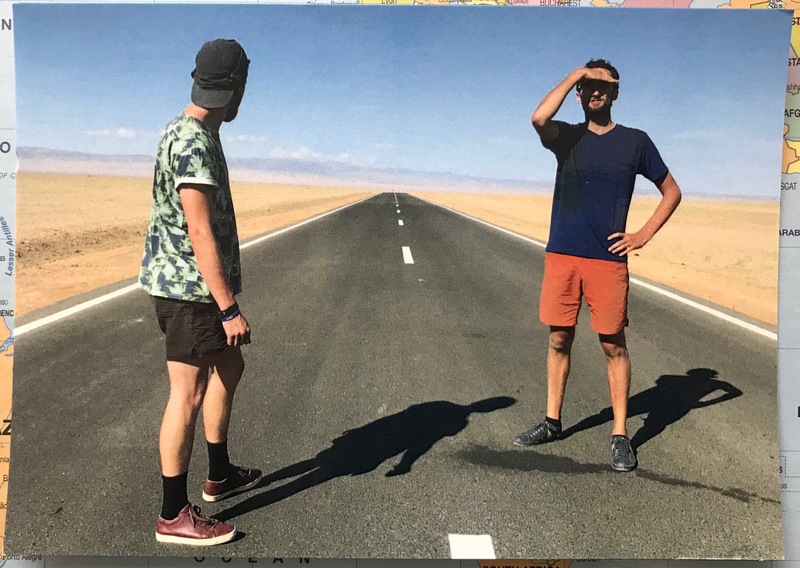 As you can see from Seb’s photograph, it is very difficult to know exactly where one is without any points of reference, crossing a desert or ocean for example. This has been an problem since humans began travelling long distances and therefore needed a method of identifying a specific location. These instruments are thought to be the most complicated tools ever invented until the modern computer. So, latitude is calculated according to the angle of the sun and/or stars compared to the horizon and this has been possible for millennia, however longitude proved more difficult. The Equator makes the obvious start point for latitude readings, but none such exists for longitude and so navigators have tended to use their own start point, until the Prime Meridian at Greenwich Observatory was established in the late 19th century. Longitude calculations depend on time. As the planet rotates dawn breaks, noon passes and the sun sets from east to west. Taking noon as the moment when the sun is highest in the sky will give you local time to set your watch by. If you know the difference between your local noon and noon somewhere else you can work out how far around the globe you are separated. Therefore an absolute time needs to be established to which a traveller, or sea-farer, can compare their local time. Flemish mathematician Gemma Frisius suggested that this method would work back in 1530 but unfortunately clocks were not accurate enough at that time to prove him right. By 1681, Italian astronomer Cassini used a telescope and a pendulum clock to record the timing of the eclipses of the moons of Jupiter. He performed this in both Paris and Goree in the West Indies, comparing both to the local noon he was able to calculate longitude accurately for the first time. As you can probably imagine, it isn’t possible to have an accurate pendulum clock on a ship at sea. Not only does the pitch and shift of the sea disturb the pendulum, but also the changes in temperature and humidity encountered by sailing long distances across different climate zones plays havoc with the mechanism. Longitude readings at sea proved so difficult that the English government offered a prize worth almost £4 million (£20 000 at the time) in 1714 to anyone who could prove that they could measure longitude to within half a degree at sea. Yorkshire clock maker John Harrison was the first to achieve this with his spring-driven clock H4. The clock worked but Harrison received only half of the prize money due to the snobbery of the panel who would have preferred one of their more eminent chums to have won it. Images of John Harrison and H4 from the National Maritime Museum, Greenwich, London. Finally it was possible to pinpoint your location accurately. The modern method is to use GPS (geographic-positioning system), the system uses 24 satellites orbiting the earth as a sort of false constellation to give reference points for a terrestrial location. GPS is capable of locating somewhere to within one centimetre. Next time you switch your sat-nav on in the car just take a moment to think about the many steps it has taken to (literally) get you there. *Mongolia itself will feature in a future blog. What a great post. I learned so much more than I did on my trip to the Greenwich observatory.